Ryanair cancelled 82 flights on Sunday after admitting it had "messed up" the planning of its pilots' holidays. "We have messed up in the planning of pilot holidays and we're working hard to fix that," he said. Most of the cancellations are due to a backlog of staff leave which has seen large numbers of the airline's staff book holidays towards the end of the year. "We advise customers to check the email address used to make their booking," he added. Ryanair has said that fewer than 2% of its flights would be cancelled and the move would help it hit its annual punctuality target of 90%. But passengers have complained about the resulting uncertainty. Gary Cummings was due to fly from Leeds to Bratislava on Friday morning. The only alternative flight he was offered was on Monday - when he was originally due to be returning to Leeds. "We were left in limbo really," he told BBC Radio 5 live. UK Aviation Minister Lord Callanan said he expected "all airlines to fulfil their obligations to their customers". "In the event of any disruption or cancellation airlines must ensure customers are fully compensated and every effort is made to provide alternative travel arrangements." "The rules say if the airline doesn't have a suitable alternative flight, you have to be booked on a rival airline," said Simon Calder, travel editor of the Independent. "It's a really odd thing in terms of customer care, to say we want to improve the operation by keeping more planes on the ground," he told the BBC. Ryanair is the biggest airline in Europe and the king of low cost carriers. But the new kid on the no-frills block is Norwegian. They've grown almost exponentially in the last three years and even plan to set up a new base in Dublin - Ryanair's back yard. To rub it in, they boasted last week of taking on 140 Ryanair pilots so far this year. Furthermore Norwegian said that the newly hired pilots would get, unlike most new Ryanair pilots, a full time job (as opposed to contractor status) and a competitive salary. 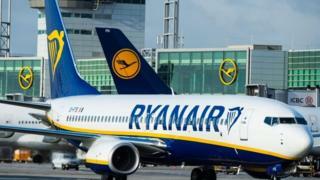 Ryanair flatly denies that there has been an exodus of staff and that that might lie behind the sudden decision to ground up to 50 flights a day for 6 weeks. It says it's cancelling hundreds of flights due to personnel and air traffic control issues. What rights do passengers have? Passengers are entitled to assistance and compensation, if the disruption was within an airline's control. Airlines have to offer full refunds, paid within seven days, or rebookings for a flight cancelled at short notice. Cancellation amounts are: 250 euros (£218) for short-haul, 440 euros (£384) for medium-haul and 600 euros (£523) for long-haul. Passengers who reach their destination more than three hours late can be compensated from 200 to 600 euros, depending on the length of flights and delay.